If you follow Middle East events through social media, you may have noticed that a good number of pro-Palestinian activists all around the world have embraced the cause of Palestinian hunger striker Samer Issawi, and are actively campaigning for his release via Twitter, petitions, and demonstrations. You may also have noticed that in sharp contrast to these fervent activities, regular media barely make any mention of Samer or other hunger striking Palestinian prisoners, and that pro-Palestinian organizations and institutions who are not directly dedicated to the situation of the political prisoners, are granting somewhat limited attention to this cause. Perhaps you are wondering: how important are these people? Do their individual causes really matter in the ‘big picture’? Is this really a collective problem that concerns all Palestinians, or just another collection of personal tragedies, of which there are so many in occupied Palestine? There are a number of reasons why Samer Issawi and the other hunger strikers deserve a full-fledged worldwide campaign, embraced by all pro-Palestinian activists, Palestinian politicians, and human rights organizations. First of all, they are victims of an Israeli practice that violates international human rights conventions and fails to meet the standards of any civilized approach to the detention of civilians. This practice, widely known by the euphemistic name of ‘administrative detention’ is an institutionalized system used by the Zionist state to terrorize, humiliate and intimidate the civilian population of occupied Palestine, under the all-encompassing false pretext of ‘security’. Israeli ‘legislation’ on this issue enables the occupier to wantonly incarcerate any Palestinian for an indefinite time period, since the official 6-month term of administrative detention can be – and often is – renewed time and time again, sometimes resulting in several years of imprisonment. This already illustrates why this issue does not only concern Samer Issawi, Akram Rikhawi, Jafar Azzidine, Tariq Qa’adan, Ayman Sharawneh and other prisoners who were left with no other means to protest against their incarceration except by refusing food. It concerns every Palestinian, because this fate could befall any of those living in the occupied territories, regardless of any connection to resistance movements, or any violation of the illegal laws of an illegal Israeli occupation. In a large number of cases, Palestinians held under Israeli ‘administrative detention’ have never stood trial, and have often not even been officially charged with the violation that supposedly led to their incarceration. They are routinely subjected to torture and ill-treatment, kept in isolation, denied family visits, and subjected to medical negligence. These are not empty accusations; websites such as those of Addameer, Human Rights Watch and Amnesty International have documented this practice in detail, and called for an end to these inhumane practices. Secondly – similar to the continuation and intensification of Israeli settlement expansion policies – the issue of administrative detention and hunger strikers illustrates the failure of international politics, and points out one of the main reasons why we continue to see a deterioration of the Palestinian situation. It exposes the malevolence of all consecutive Israeli governments, and highlights the impotence and weakness of the current Palestinian Authority. It also puts mediators and negotiators to shame, who once took pride and prominence in having sealed ‘agreements’ on prisoner release issues. It is widely ignored by media as well as by aforementioned politicians, that Israel has repeatedly violated the agreements of the much publicized Egypt-mediated ‘prisoner-swap’ deal that led to the release of prisoner of war Gilad Shalit. These transgressions are all documented, especially by organizations such as Addameer, but they are not the only illustrations of the untrustworthiness of the Israeli ‘legal’ apparatus. In this context, the example of Akram Rikhawi, which shows an Israeli violation of another ‘deal’, can be mentioned here. Akram ended his previous 102-day hunger strike on 22 July 2012 after an agreement was reached to release him on 25 January 2013, six months prior to his original release date. This date passed without his release, which left Akram, who has been left with a number of chronic illnesses due to his ordeal, no other choice but to resume his hunger strike. It is clear that those who are putting their lives on the line by refusing food, in their protest against baseless imprisonment and dehumanization, are not doing this merely to advance their own personal cause. They are in the frontline of the Palestinian challenge to the occupying forces to advance the rights of all Palestinians, including those of ordinary Palestinians who are currently attempting to live a normal life under occupation outside of prison, since they are subjected to the same preposterous ‘laws’, and potentially to the same inhumane treatment. While these brave Palestinians refuse to accept food from their Zionist jailers in an attempt to forcefully call the world’s attention to these injustices, will the international community be silent, and let them die under the inhumane circumstances of wanton imprisonment, torture, and negligence? We surely hope not, but by what available means can the cause of the hunger strikers be supported? Collectively addressing these authorities by signing petitions already sounds like a better plan. If large numbers of signatories can be collected, they can be publicized, and force an official response from the Israeli authorities. In order to achieve this, however, the stubborn refusal of international media to give attention to this issue must be broken. There is only one thing that the media can rarely afford to ignore: the mobilization of large numbers of people. This has the potential to force media attention, which in turn can force a response from the political echelons. This brings us back to where we started: it all starts with the mobilization of those who are sensitive to the rights of Palestinians. This can be done by solidarity fasts, by taking it to the streets, as was done recently in Washington DC, and by massive social media campaigns on Twitter, Facebook, and other platforms. To illustrate how this can be done successfully, the learning experience from the Twitter actions surrounding the situations of Khader Adnan, Hanaa Al Shalabi and Mahmoud Al Sarsak must be recalled. The impact of social media mobilization, in their cases, eventually helped in breaking the barriers of regular media silence, and played a role in securing their release and an end to their hunger strikes. We have now embarked on a campaign to support Samer Issawi, who is breaking all records with his now 194-day (!) hunger strike. The tireless efforts of Abbas Hamideh, National Chair of Al Awda from the USA, in waging the Free Samer Issawi Campaign must be mentioned in this respect, as well as the website Freesamer.org, run by Haithem El Zabri. Aided by the invaluable efforts of other tireless supporters such as Malaka Mohammed and Samer Issawi’s sister Shireen, they have been able to generate quite an impressive wave of support for Issawi, but more support is needed. Lots more people are welcome to join their Facebook page! What would most certainly make a difference, is a more active involvement of other pro-Palestine activist groups. In order to be able to call attention to his cause, and that of other Palestinian prisoners currently on hunger strike such as Akram Rikhawi, Jafar Azzidine, Tariq Qa’adan and Ayman Sharawneh, it is our collective responsibility to embrace and adopt these initiatives, and support them with maximum effort. The worldwide Palestinian community has many talented writers, who are eloquent in expressing and describing all political and humanitarian aspects of this urgent issue. While I applaud those that already have, I can only ask the remaining ones to dedicate their pens to an article about the cause of the Palestinian hunger strikers. Such articles can be very compelling methods of mobilizing not only pro-Palestinian ranks, but also those of human rights activists who usually give their attention to other causes. Needless to say, this action call is also directed to other pro-Palestinian writers. Through my Musical Intifada project, I have attempted to empower this campaign by releasing a new song dedicated to these brave hunger strikers, called ‘HUNGRY’. The campaign for Samer Issawi is a campaign for all those on hunger strike, and so is this song. It refers to some elements of his personal situation, as well as to other more general issues connected to this cause. Such a song can be used to draw attention to the campaign, but it really depends on your support: in order for it to be effective, it must be publicized on websites, retweeted, reblogged, and most of all: heard. I am grateful for the support that many individuals have lent to it, but just like the Free Samer Issawi Campaign itself, it lacks the endorsement of prominent pro-Palestine activists and groups. Perhaps you can help encourage them to do so? See the links at the bottom of the article, and there is also one provides the code that enables you to embed it on your website. The song is currently available for free download. This also brings me to the one point of action that has as yet gone unmentioned, namely the deployment of all types of art in this struggle for human rights. I applaud the artists who already have contributed their posters and poems to this cause, but I wish to go a little further than that. I call upon artists from all fields of art, including poets, musicians, graphic artists and expressive artists such as actors and dancers to dedicate some of their art to the cause of the hunger striking Palestinian prisoners. No doubt, we will all do our very best to propagate and disseminate such art once it has been created. 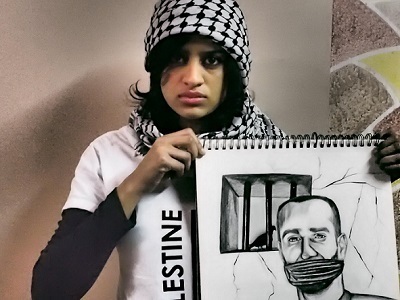 To encourage you, look at this powerful image of Shahd Abusalama holding the picture she drew of Samer Issawi (See photo above). As long as Samer Issawi breathes, we will give him our full support in his courageous struggle. We also extend our love and compassion to his loving family, for whom this situation must be an unimaginable ordeal. May God forbid that we see the day when Samer or any of the other hunger strikers breathe no more, but if it should come, we will ensure that their struggle will not have been in vain, by continuing it until victory. – Tariq Shadid is a Palestinian surgeon living in the Middle East, and has written numerous essays about the Palestinian issue over the years. Most of these were published by the Palestine Chronicle and have been bundled in the book “Understanding Palestine“, which is available through Amazon.com. He also runs a website of internationally oriented music dedicated to the Palestinian cause, which can be found at www.docjazz.com. He contributed this article to PalestineChronicle.com.